GREAT NEWS! 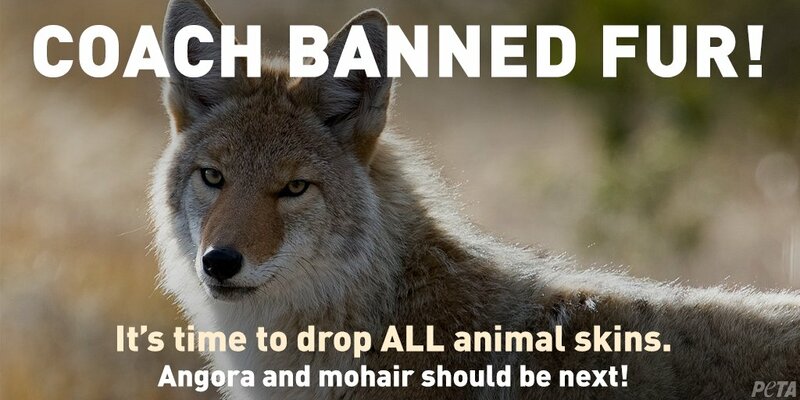 @Coach has banned fur, saying that it’s the “right thing to do.” Today’s shoppers don’t want to wear the fur of any tormented animals, so we urge #Coach to extend the ban to angora and mohair. Coach joins the hundreds of designers and retailers around the world—including Burberry, Versace, Giorgio Armani, Gucci, Vivienne Westwood, Stella McCartney, and others—in banning fur, most of which comes from animals who spend their short, miserable lives inside cramped wire cages before being electrocuted, bludgeoned, suffocated, or even skinned alive. The company’s compassionate move is further proof that the future of fashion is vegan. Banning angora wool and mohair—as more than 300 companies already have—is also the right thing to do. Please quickly take action to urge Coach to extend its compassion to rabbits and goats by banning angora and mohair. Coach banned fur because, as its CEO said, “it’s the right thing to do.” Please thank the company for taking this compassionate step and urge it to stop supporting horrific abuse of goats and rabbits by banning mohair and angora as well. Thank you to everyone who helped us achieve this victory. Progress isn’t possible without you ! My comment: Yes! if we stay united, then we can win! If we think that petitions and small steps do not work, we can only lose. With the mentality of “all or nothing” in animal welfare, we often end up to nothing. In my city in southern Germany, the German Welfare Office had organized a systematic campaign against a department store chain, because the store sold fur heavily. I was part of this campaign. Recently, the store official said that they no longer carries and sells fur! Our fight has worked, so we will never stop fighting for animals. Until death separates us from these!